Eighty-five years after its discovery in 1930, the distant and mysterious Pluto will finally become an "explored" planet. 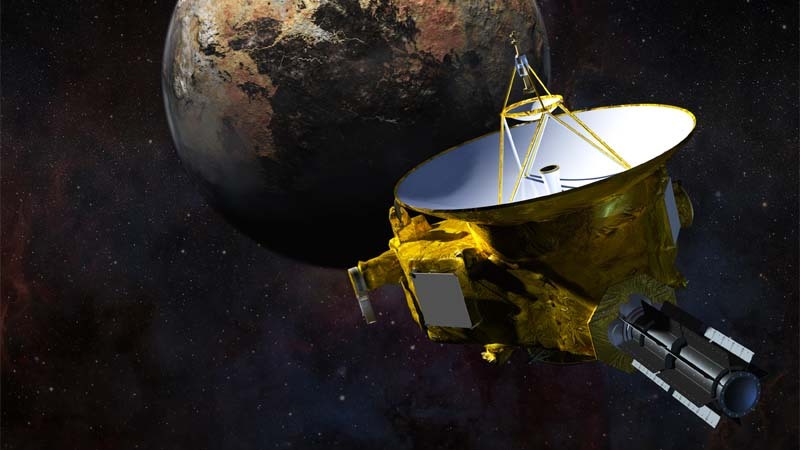 NASA's New Horizons spacecraft has been en route to Pluto for nearly ten years, and is almost there, speeding toward a close encounter on July 14. As of late May, New Horizons was less than 35 million miles from its target--roughly the same distance from the sun to the planet Mercury. In December, the small, nuclear-powered interplanetary probe awoke from a state of robotic hibernation to make ready for the flyby. Since waking, mission operators have performed systems tests and captured approach images of the Pluto system from a distance. The upcoming flyby encounter is a proverbial "don't blink or you'll miss it" scenario, so making sure that all systems are go is imperative. A series of images captured by New Horizons' Long-Range Reconnaissance Imager (LORRI) instrument shows us clearly what we have known analytically for some time: that Pluto and its largest moon, Charon, are more of a double-planet than a planet and its moon. Charon is half the diameter of Pluto, so large in comparison that the two actually orbit a point in space between them, like a pair of figure skaters swinging each other by the hands as they spin. New Horizons has captured images of Pluto's five known moons, one by one. First was the large moon Charon, which it spotted almost two years ago. Two smaller moons, Hydra and Nix, came into view in July 2014 and last January. Finally, in late April/early May, the two smallest and faintest known satellites, Kerberos and Styx, were revealed, completing the family portrait. If there are more moons orbiting Pluto, New Horizons is well-positioned to discover them as it draws closer. A Polar Ice Cap on Pluto? In late April, from a distance of 70 million miles, New Horizons began to capture images of surface features on Pluto, including a bright spot located at Pluto's visible pole. It's too soon to tell, but a bright area at a planet's pole is suggestive of a polar ice cap, as on Earth and Mars. These images prove that New Horizons has begun to show us things we've never seen before--things we cannot presently see from Earth. When New Horizons launched in 2006, it set forth to explore the smallest, most distant, and least understood planet in the solar system. Despite the fact that the International Astronomical Union reclassified Pluto as a dwarf planet shortly after launch, our scientific and imaginative curiosity about this small world is unchanged. In fact, one of the reasons that Pluto was reclassified is that it is different from the major planets, and more similar to other objects found orbiting the sun beyond Neptune's orbit. Representative of a little-understood group of celestial bodies, the "ice dwarf planets," one of four discovered so far, the exploration of Pluto and its moons is a first look into a realm of our solar system that we know almost nothing about. Since childhood, I—along with millions of others—have dreamed about what Pluto may be like, envisioning a dark, icy landscape glittering under the weak rays of a sun no brighter than an exceptional star. That long dream is almost over--and my excitement is hard to contain!